I heaved up a hill, over dramatically praying that, indeed, just one more pedal would get me up and over that protruding rock. Our group of bikers, a mix of the CLIF Bar corporate team and travel writers, paused for a break at the top as a bunch of waist-high riders waited their turn to descend. That’s when a small voice squeaked with contradicting authority, “I’m going to be the first one down. Now remember, bend your arms.” She spoke as if her coach wasn’t right behind her. “Level feet.” Despite her large amount of gusto, this little girl pumped her tires on a bike the size of my backpack and wore a helmet that likened her to the Great Gazoo. “Can I be the second one down?” a boy behind her meekly asked. “Fine,” she said over her shoulder, and everyone in our group laughed. We travelled to Whistler for mountain biking—in particular, as spectators of and participants in Crankworx, the international mountain biking festival. The festival attracts top mountain biking talent from all over the world, such as Hans “No Way” Rey, a world traveller and philanthropist who’s cycled all around the globe. 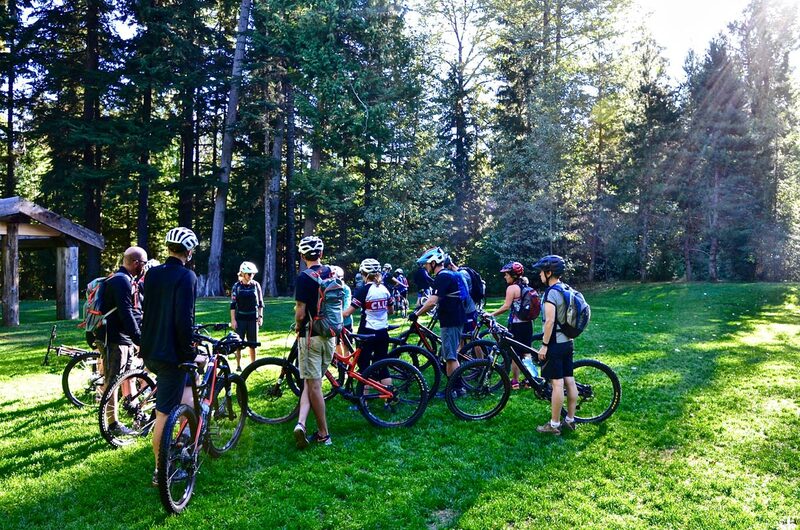 We began our day with Dirt Series, a mountain-biking camp first designed to get women more excited about the sport. (Disclaimer: they succeeded.) The camp consisted of mountain biking fundamentals mixed with extensive skills sessions and a tiny powerhouse lovingly yelling at you to “pedal, pedal, pedal!” as you ascended over tricky terrain. Mountain biking has the unique ability to fire up my nerves like no other extreme sport. Not snowboarding, where a fall can at least be rationalized by the promise of snow-padded landing. Not mountaineering, with the false sense of safety that comes with ropes. Not surfing, with its water landing. The only promise a mountain-bike fall makes is bruised knees, scraped shins and broken bones. We had a few spills on our group, and it was my first hint at what a cohesive culture mountain biking has. Riders beyond our group would stop and check if the faller was okay; the fallen would rise with new zeal, ready to re-attack whatever obstacle unseated them. I asked CLIF Bar pro rider Mark Matthews what bones he’s broken; his list was so exhaustive I couldn’t keep track. As he left our conversation to compete, I was about to say “break a leg,” but then thought better of it. A story about his shattered femur stood out in my mind. After a day of shredding—for some, perhaps “lightly grating” would be a more appropriate euphemism when compared to what we were about to see—we were invited into the CLIF Bar tent to watch the pros compete in the Pump Track. In this particular event, two riders competed for speed, barrelling parallel down and through a course that’s designed to have the riders pump rather than pedal through a maze of berns, banks and rollers. In layman’s terms, this means riding down a slope, up and down a couple air-inducing bumps and around a very sharp bend, all without pedalling at all, as fast as possible. The athleticism is incredible to watch. Blink and you’ll miss the riders as they whiz by. The riders compete for speed, but their bikes have no gears—no pedalling allowed. They use a mix of gravity, momentum, concentration and—in my mind—magic to go as fast as they can without losing control of the bike. We saw a couple competitors go over the handles, each time activating my instinctive reflex to look away, proving there’s not just adrenaline for the competitors but the audience as well. 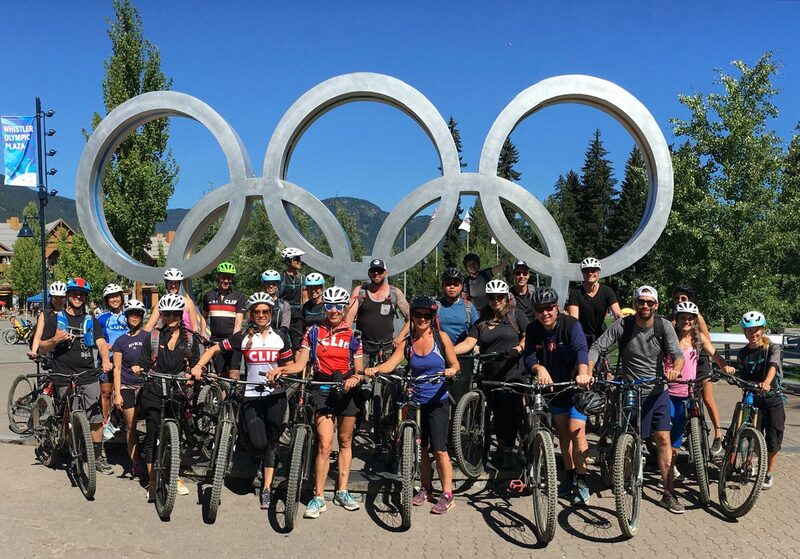 While adrenaline is certainly a large part of mountain-biking culture’s allure, I’d venture to say the community aspect is greater. The crowd was full of a wild energy. Spectators lined the hills with beer cans in hand, kids stood with their noses pressed to the gates, hoping to watch their idols blaze on down. At spitting distance, the pros sat on lawn chairs watching their comrades compete, some lounging leisurely, shirtless and uninhibited, others with their own noses pressed along the fence just like their younger audience. Hans Rey walked through the crowds smiling in selfies with fans. Maybe it’s the dirt, maybe it’s having literally have your bones handed to you, but in this sport, no one goes unscathed. I guess that’s why I felt that ego doesn’t seem to play a big role in this sport, nor in its community. Everyone rides together, takes care of each other, supports each other. Hubris, on the other hand—well, as that little girl evidenced along with the pros, you’ve got to have that.